Do you have red, tender, or swollen gums? Do they often bleed when you brush or floss? You could be experiencing symptoms of periodontal disease. Today, we will discuss the three stages of gum disease, and explore ways to identify, treat, and prevent this condition. At Metropolitan Dental Care, our doctors provide a wide array of periodontal treatments to keep your teeth and gums looking great for years to come. If you are seeking treatments for gum disease near Lone Tree, contact us to schedule a consultation. To make an appointment, please call 303.534.2626 or contact us online. Simply stated, bacteria cause gum disease. Oral bacteria live in the plaque deposits that form around the teeth. If plaque and debris are not regularly removed through daily brushing and flossing, the bacteria can begin to irritate the gums. While these bacteria are often the result of poor hygiene, this is not always the case. Some people are simply more genetically prone to periodontal issues. For example, patients with diabetes are more likely to develop gum disease, as is anyone with a significant family history of the condition. Additionally, dry mouth can lead to periodontal problems. Dry mouth is often caused by certain medications or genetic issues. The first stage of periodontal disease is gingivitis, and it is the only stage that can be completely reversed. When plaque irritates the gums, they become tender, red, and puffy. If the plaque is removed at this stage, the condition can be corrected and healthy gums can be maintained. Typically, treatment for gingivitis involves a dental cleaning and improved oral hygiene at home. If gingivitis is not treated, it can progress into periodontitis. At this stage, the bacteria around the teeth begin to seep into the gum line, affecting the underlying bone. Once the infection is under the gums, it can begin to dissolve healthy jawbone, creating pockets around the teeth. These pockets can create food traps which harbor debris and bacteria, causing further damage to the bone that supports the teeth. Generally, gum disease is not painful. However, you may begin to notice a bad taste or bad breath in addition to bleeding, swelling gums. 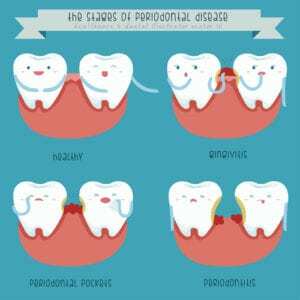 To address periodontitis, a deep cleaning is typically necessary. Also referred to as scaling and root planing, this procedure is a non-surgical approach to removing bacteria and infection. In addition to cleaning the teeth, the roots are also smoothed to prevent further plaque and food from reattaching. The third and final stage of gum disease is advanced periodontitis. Once the infection has reached below the surface of the gums, it will continue to erode the jawbone over time if left untreated. This can result in an array of serious oral health concerns, including mobility and tooth loss. Treating advanced periodontal disease typically requires surgery. During this procedure, the gums are moved back, the infection is cleaned out from around the teeth, and the gums are repositioned. In some cases of severe bone loss, bone grafting may be beneficial to help regenerate some of the lost density. Once you have undergone treatment for gum disease, you must maintain your oral health through regular dental cleanings. The frequency of your cleanings will largely depend on your unique situation. For example, the majority of dental patients have cleanings every six months. However, if you are more prone to periodontal issues, more frequent visits may be recommended. By adhering to a cleaning schedule determined by your dentist, you can keep bacteria levels at bay and give yourself the best chance for long term oral health. If you require treatments for gum disease in Lone Tree, or if you are experiencing signs of periodontal disease, contact our offices today to speak to a team member. To schedule a consultation, call us at 303.534.2626 or contact us online.